A110-10 PERMLY LGTD & MKD 226' TWR ATOP MT ALAVA 4.3SM NNE ARPT. A110-4 SEA SPRAY FM SURF & BLOW HOLES MAY DRIFT ACRS RWY 05/23 UNDER ROUGH SEA CONDS. A110-5 ALL ACFT TRANSITING PAGO PAGO (EXCP COMMERCIAL CARRIERS) MUST MAKE FUEL ARRANGEMENTS WITH PPG AT 684-733-3158. A110-6 ALL ACFT EXCDG 100000 GWT UPON TD TAXI TO THR TURN- ARND BFR TXG TO APRON. ACFT UNDER 100000 MAKE TURN-ARND WHERE FEASIBLE. A110-9 OLOTELE MT 1617 FT MSL 3.5 MILES WEST OF THLD RY 08. A13 PAGO PAGO IS OWNED BY THE AMERICAN SAMOA GOVT AND IS OPERATED BY THE PORT ADMINISTRATION, DR. CLAIRE POUMELE, PORT DIRECTOR, PHONE 684-733-3076. A57-23 RY 23 50:1 TO DSPLCD THLD. A81-APT DUSK-DAWN. ACTVT HIRL RY 05/23; MALSR RY 05; VASI RY 05, PAPI RY 23; HIRL RY 08/26 & TWY LGTS FREQ - 118.3. 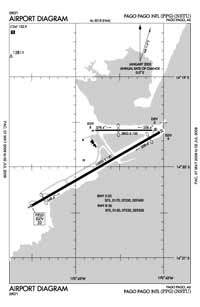 A83 LGTD WIND CONE 800' FROM THR & 240' SE RWY 05 CNTRLN. Dual Dual Tandem Wheel Landing Gear: 600.